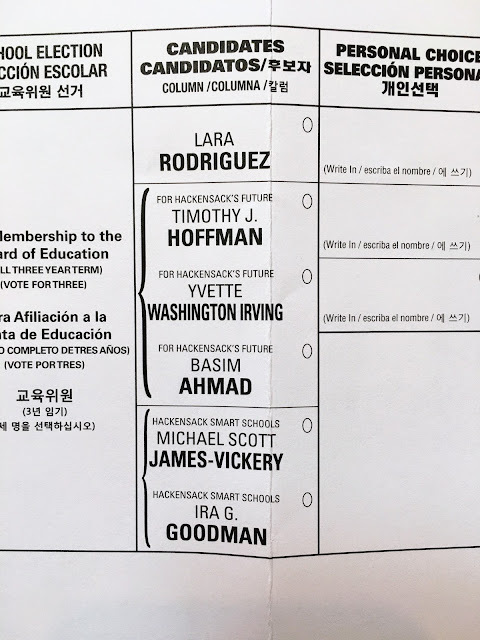 In next Tuesday's election, the City Council is backing Board of Education President Lara Rodriguez, Michael Scott James-Vickery and Ira G. Goodman. 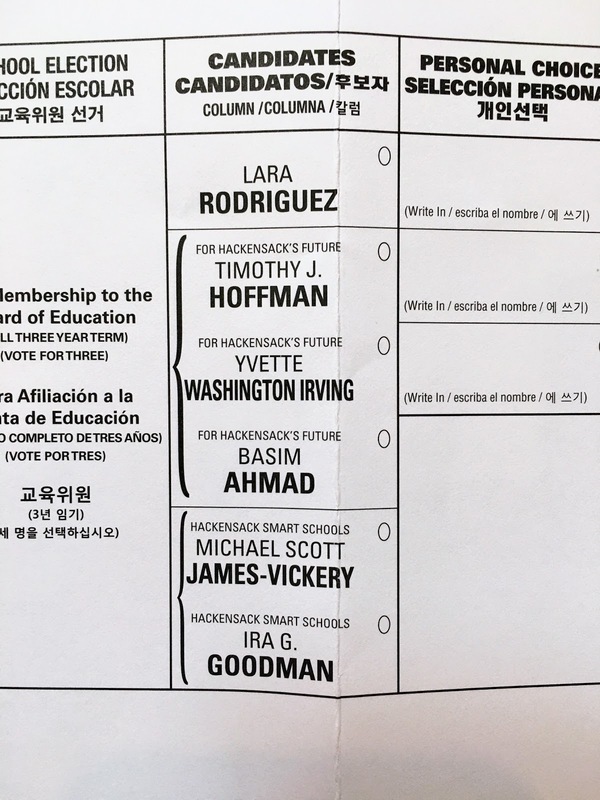 James-Vickery and Goodman are members of Hackensack Smart Schools, the taxpayers group that defeated the irresponsible $170 million school construction and renovation plan (and 30-year tax hike needed to pay for it) that were on the ballot in January. Editor's note: I corrected the name of the Hackensack school where the boiler stopped working this winter. HACKENSACK, N.J. -- In next Tuesday's school election, Mayor John Labrosse and other members of the City Council are hoping to take control of the Board of Education and cut the bloated $126.5 million school budget plan. Voters can say "no" to the proposed $84.5 million tax levy to support the 2019-20 school budget, sending the plan to the council for cuts. 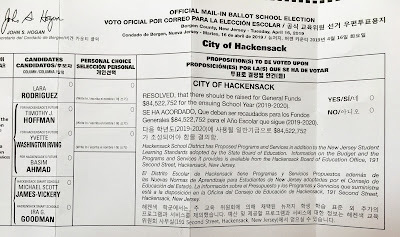 But sadly, legions of Hackensack residents don't know that, and in past April elections, the budget has been approved by a margin of a few hundred voters. More than 23,000 residents are registered to vote in Hackensack, and about 45% of every property tax bill goes to support the schools. Whether through ignorance, apathy or laziness, residents have allowed the Zisa family political dynasty to control their schools, which are known for high salaries and low test scores. In the 2018 school election, the proposed tax levy proposition was approved 695-447. "We don't agree on everything, but we do agree on the most important issues," Board of Education President Lara Rodriguez was quoted as saying about her running mates, Michael Scott James-Vickery and Ira G. Goodman. "We know that our schools are in need of major physical and technology upgrades. We know that our children deserve better ... in a manner that has the least impact on taxpayers," she told TAPIntoHackensack. 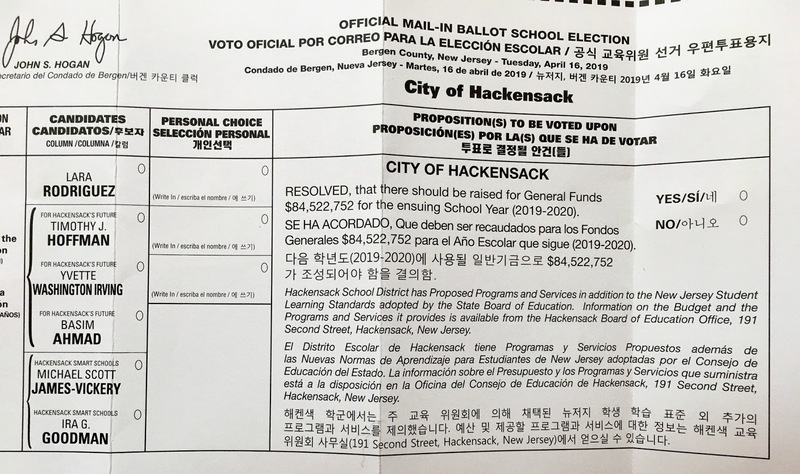 Rodriguez, Michael Scott James-Vickery and Ira G. Goodman are running under the banner of Hackensack Smart Schools, a taxpayers group that mobilized to defeat the all-or-nothing $170 million school referendum in January. James-Vickery brought his family to Hackensack seven years ago from Mississippi, where he taught for 10 years. A strong advocate of special education, he has 3 children in city schools. Goodman is a 17-year resident with a strong technology background. 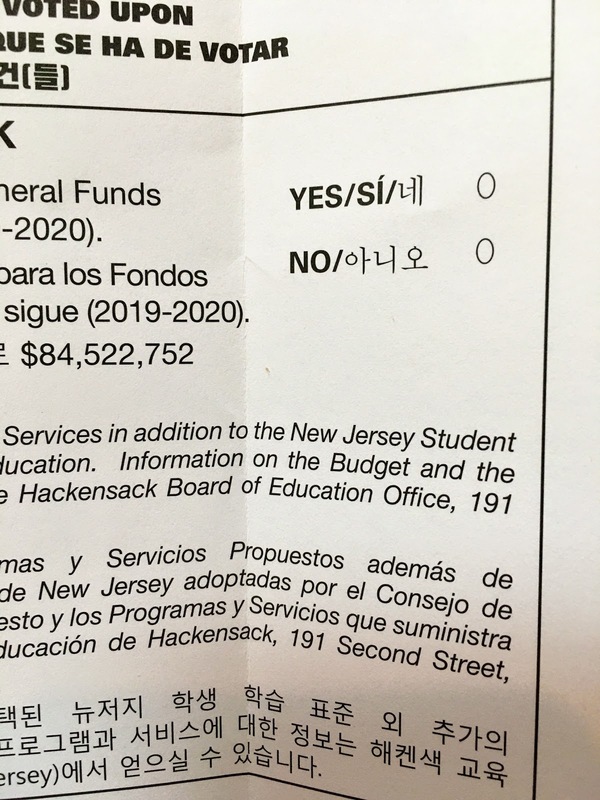 The mail-in ballot I received shows candidates for three open seats on the Board of Education, and the budget proposition that $84,522,752 in property taxes be used to support an overall school budget of $126.5 million, above and below. Every voter can say "yes" or "no" to the budget. A "no" vote on the school tax levy next Tuesday would send the proposed budget to the City Council, which can cut the plan or leave it intact. In addition to property taxes, the schools are supported by tuition from other districts, aid and grants. Zisa-backed Board of Education members have rewarded administrators and teachers handsomely, but test scores have lagged at the majority of the city's schools. The average salary for an administrator is about $169,000 a year, highest in the state, City Councilman Leo Battaglia said. The average salary for a teacher is about $83,000, among the highest in the state, and the school board spends $18,700 to educate each student, he said. More than 160 students weren't able to provide proof of residency, but city officials believe the number attending Hackensack schools from out of the district is well over 200. The average age of city schools is 100 years, board officials said when they proposed the $170 million renovation and building plan, which included a new junior high school and parking garage on the high school campus. This winter, the boiler stopped working at the Fanny Meyer Hillers Elementary School, and teachers and students had to wear their coats and gloves in the classroom. ed drum beat. Get your facts before trying to present yourself as knowledgeable. In March 2017, the Zisas -- Jack, Ken and Joseph -- backed five candidates for the City Council, and named Lara Rodriguez, then vice president of the Board of Education, as the head of the slate running under the Hackensack United for Progress banner. Another candidate, Rommy Buttafuocco, was identified as a 16-year employee of the Board of Education. The year before, 2016, the Zisas' Team Hackensack backed three candidates for the board, including Rodriguez, and all three were elected. Now, Rodriguez, as president of the board, is allying herself with candidates backed by the City Council. Plus, Zisa ally Richard Salkin long served as school board attorney, and blocked the city's effort to be paid $1 million for a school resource officer at Hackensack High School; he argued the board didn't have to pay for the police officer because the city never billed the board. So, what is inaccurate in my post? Also, critics who hide behind "Unknown" are suspect from the outset. Have a nice day.